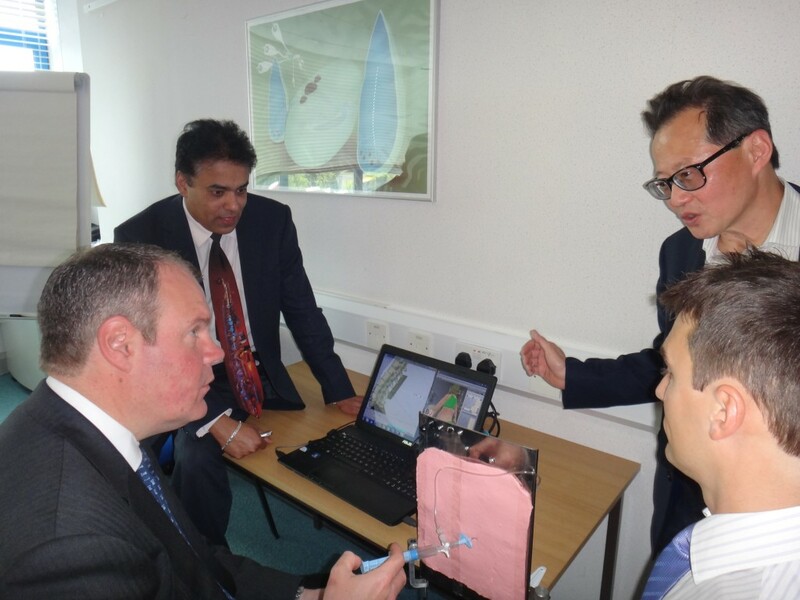 Conor Burns MP has visited Data Science Institute, Bournemouth University to view the Epidural Simulator research. Conor Burns’ visit is documented further in an article on his website. On 7th July 2014 Bournemouth West MP Conor Burns paid a visit to Bournemouth University to get a second update on the Epidural Simulator project. Conor Burns MP had previously come to meet the Epidural Simulator team at BU in 2011. The epidural simulator project, led by Dr. Venky Dubey with Dr. Neil Vaughan and in collaboration with Poole Hospital, has created an epidural simulator that will help to train doctors to carry out the procedure, reducing the risk of harm to patients. The simulator uses complex software that mimics the variable conditions involved in giving a real-life epidural to a woman in labour, allowing doctors to safely practice in a way that will lead to more successful results in real-life. The project has been the subject of international attention, and was winner of the prestigious Institution of Engineering and Technology (IET) Innovation Award from over 400 entries in 30 countries worldwide.